The Fashion Photography and Videography in Grand Cayman program culminates in a gallery show which will be holding its closing reception today. 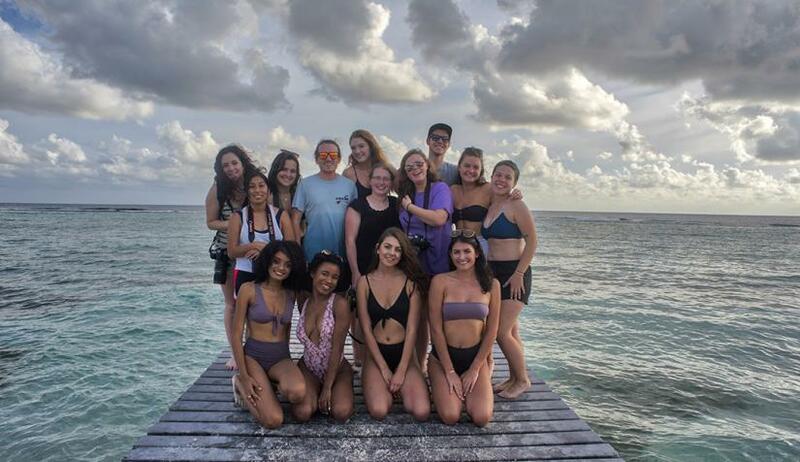 The show is open to the public in the VisCom Gallery, allowing all community members to see what students created during their time in the Caribbean island of Grand Cayman. Sam Girton, an assistant professor in the School of Visual Communication and program director, said the program gives students the advantage of having portfolio work shot outside of Ohio. Some clients the students worked with include Unitus Athletic Wear, The Fig Leaf Boutique, Ohio Valley Running Company and Peripheral Sunglasses Company. Students were also able to get advice from Heather Holt, an OHIO alumna who works as a professional photographer on the island. Grace Ziemke, a fourth-year student studying visual communication, said the program was beyond anything she could have ever asked for. Girton said the first program commenced in December 2017 and he plans to do the program once every two years. He took 10 students and asks that students interested enroll in a one credit course for fall semester to prepare for the trip. The program is open to all OHIO students, with roles including project management, fashion photography and videography. During the program, students gain real work experience scouting locations, networking with local professionals, preparing for shoots and processing post production objectives. The exhibit will conclude on Thursday, Jan. 31 with a closing reception from 5 to 7 p.m. in the VisCom Gallery, located in the Schoonover Center lobby. The photos and videos can also be found online here.